Healthy sleep formula with calming benefits. Contains valerian, tryptophan and hop. Natural sleep supplement formulated to reduce the time it takes to fall asleep and improve sleep quality. 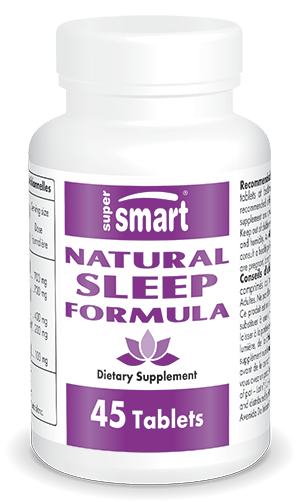 Our dietary supplement Natural Sleep Formula is designed to provide a simple and effective solution to sleep problems, be they occasional or chronic. In a single capsule, it combines a combination of natural ingredients including valerian, hop and rhodiola. These natural extracts have been the subject of numerous scientific studies because of their positive effects on sleep. With its optimal formulation, Natural Sleep Formula is aimed at anyone who has lost the ability to get good, restorative sleep. Its natural active principles work to combat a range of sleep problems – difficulty in falling asleep, night wakefulness or insomnia. Being sleep-deprived can often impair general well-being and cause extreme fatigue, lack of concentration and increased irritability. It is therefore important to tackle these problems at source, by making it easier to fall asleep and by promoting good quality sleep. Our product Natural Sleep Formula contains an extract of valerian root which is known for its tranquillising effect and is traditionally used to calm the nerves. Valerian’s soothing effects thus encourage drowsiness and improve sleep quality. Its sleep-enhancing effects are boosted by the addition of hop, a plant which also has sedative, soporific properties that relieve anxiety and tension. The combination of valerian and hop makes Natural Sleep Formula ideal for inducing calm and serenity before falling asleep. In addition to valerian and hop, Natural Sleep Formula also contains two other natural extracts: Rhodiola rosea and Eschscholzia californica. Rhodiola (Rhodiola rosea) is recognised as an adaptogen plant, which means it can help the body adjust to stress. It is therefore helpful for restoring the body’s equilibrium and reducing the stress that can impair sleep quality. Californian poppy (Eschscholzia californica) is useful for reducing the time it takes to fall asleep and improving sleep quality. Its beneficial effects are related to an exceptional content in alkaloids, particularly protopine. For optimal efficacy, Natural Sleep Formula has been enriched with tryptophan or L-tryptophan. Naturally present in the body, this amino acid plays a key role in the sleep cycle. It is actually the precursor of melatonin, known as the ‘sleep hormone’. Ensuring an optimal intake of tryptophan is thus essential for achieving restorative sleep fast. Our supplement offers the benefits of all these natural active principles in a single capsule. Each supplement contains 350mg of valerian root extract, 100mg of hop extract, 200mg of Rhodiola rosea root extract, 50mg of Eschscholzia californica root extract and 350mg of L-tryptophan. The recommended dose for this optimal formulation is one to two capsules, taken before bedtime, though this can, of course, be adapted to your needs and to the advice of your therapist. Two other supplements for tackling sleep problems and helping you manage stress better are Stress Relief Formula and Adrenal Support. Take one or two tablets at bedtime or as advised by your therapist.